In the summer of 1924 Claude Friese-Greene, a pioneer of colour cinematography, set out from Cornwall with the aim of recording life on the road between Land's End and John O'Groats. Entitled The Open Road, his remarkable, ground-breaking travelogue was conceived as a series of shorts, 26 episodes in all, to be shown weekly at the cinema. Although creating an initial impact when it was first exhibited at trade shows in 1925, Claude's experimental colour process failed to reach a large audience owing to heavy flicker and colour fringing. The original negatives were deposited with the BFI for preservation in the late 1950s. Great enthusiasm for the film was created by the documentary series The Lost World of Friese-Greene, a co-production with the BBC that was televised in April 2006 and released by the BFI on DVD. Now the BFI National Archive has restored a special compilation of highlights from the journey, using digital intermediate technology (the archive's first such project) to remove the technical defects of the original. 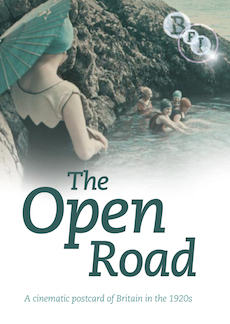 The Open Road is important both as a landmark in the development of colour on film but also as a fascinating social record of interwar Britain. The journey, from Land's End to John O'Groats and back to London, was made in a Vauxhall D-type. The travelogue format provided the ideal way to profile the colour process because the natural world was more of a challenge than the contrived studio set. Iconic landmarks would be instantly recognisably to the audience, and today the audience has the opportunity to revisit those locations and assess similarities and changes that have taken place. The film is presented here with a new score by Neil Brand – world-renowned composer and silent film accompanist on piano – and equally renowned violinist and silent film accompanist Günter Buchwald. The restoration was generously supported by the Eric Anker-Petersen Charity. New score by pianist Neil Brand and violinist Günter Buchwald.